The City Council is preparing to debate three separate proposals to hike the minimum wage. CITY HALL — A streamlined, fast-tracked measure from the mayor to raise Chicago's minimum wage to $13 an hour over the next five years cleared committee Monday and headed directly to a "special meeting" of the City Council on Tuesday. Administration officials suggested that the city was racing a statewide bill in the General Assembly that could limit Chicago's ability to raise the minimum wage in the city above the state level, although some aldermen and business interests took issue with what Ald. Brendan Reilly (42nd) called "such a rush" to passage. 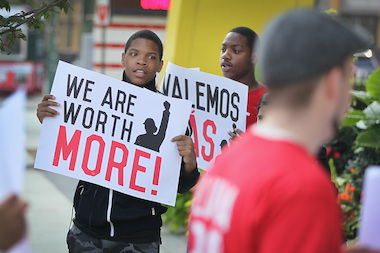 The measure, tweaked last weekend by Mayor Rahm Emanuel's administration, would hike Chicago's minimum wage to $10 an hour in July, $10.50 a year later, $11 the year after that, then in one-dollar annual increments until reaching $13 in July 2019, after which it would be tied to inflation. Tipped wages would rise from $4.95 to $5.95 and then be tied to the same increases. It passed the Workforce Development Committee by a voice vote, with Aldermen Reilly, Tom Tunney (44th) and Michele Smith (43rd) asking to be recorded voting against. It heads to a special meeting of the council Tuesday. Testimony for and against broke down along expected lines. Ald. Will Burns, who was one of the chairmen of the "Working Group" appointed by the mayor to address the issue, sponsored the $13 proposal the panel advocated and led its passage. He said low-wage workers had "waited long enough" for a pay increase, in that "the minimum wage has not kept pace with the cost of living." Yet Tunney, who also owns the Ann Sather restaurants, took issue with administration estimates that the hike would trigger only minimal increases in business costs estimated at up to 1.5 percent in the first year. Michael Negron, of the Mayor's Office, countered that it would bring 70,000 Chicago workers out of poverty, 5,000 of them single mothers, and would have an $860 million impact on the local economy, with low-wage workers expected to spend the money in their neighborhoods. Restaurant owners led the chorus of opposition in testimony before the committee. Sponsored by the Progressive Reform Caucus and Ald. Joe Moreno (1st), the $15 proposal would take effect within a year for "large employers" with $50 million in gross revenues, like big-box stores and chain restaurants, and would gradually raise it to $15 for smaller employers over four years. It's endorsed by 21 aldermen. "We need to work, over the next couple of hours, over the next couple of days, to get the best deal we can for Chicago's workers," said Ald. John Arena (45th), a member of the progressive coalition, at a City Hall news conference Monday morning. Ald. Bob Fioretti (2nd), a progressive who is challenging Emanuel in the February municipal election, said the mayor's proposal does not raise the minimum wage enough. "We have to fight for $15," Fioretti said. "This isn't a victory. It's just a step forward toward what we need, and anything less is unacceptable." The Raise Chicago Coalition of neighborhood, grassroots and union groups signaled it was ready to accept the mayor's proposal as a compromise. "Chicagoans need $15. But $13 is a good place to start," said Katelyn Johnson, executive director of Action Now. "We're not willing to settle for anyone living in poverty." Most aldermen supporting the $15 proposal agreed, with Moreno and Burns embracing at the end of the committee meeting after the $13 measure passed. Yet Tunney led business leaders in opposition immediately before the meeting. "Labor costs are probably the largest costs in any small business, and certainly in the restaurant business," he said. "Our jobs were never meant to support a family of four." Tunney called a hike in the minimum wage "a strong disincentive to not hire." Sam Toia, president of the Illinois Restaurant Association, decried the "haste" in moving to pass a controversial matter in two days with little debate. "We'd like to see a more reasonable and rational approach," added Rob Karr, president of the Illinois Retail Merchants Association. Mayoral spokeswoman Kelley Quinn explained the haste by saying if the city wage is passed, "We believe it will make it more difficult for Chicago legislators to vote [for] a pre-emption" of home-rule powers downstate, where the General Assembly is studying proposals to raise the minimum wage to $10.10 in its lame-duck session. Johnson echoed that, saying she supports a bill in the General Assembly that might raise the state minimum wage to $10.10 an hour, but would leave Chicago free to set its own. Arena pointed to how the cost of living in the city is higher than downstate, saying, "Chicago needs to be able to manage its own economy." Yet the Chicagoland Chamber of Commerce, Illinois Hotel and Lodging Association, Illinois Restaurant Association and Illinois Retail Merchants Association have all lobbied against the hike in the city minimum wage, most recently at a Workforce Development Committee meeting last month, and insisted it would put city businesses at a disadvantage compared to those in the suburbs and across the border in Indiana and even Wisconsin. Carr said IRMA would lobby in Springfield to pre-empt home rule if the city minimum wage passed. "The state could come in and pre-empt retroactively," he said. Toia also threatened legal action, saying, "Everything's under consideration."